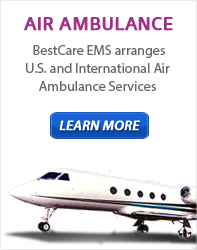 BestCare EMS – Ambulance & Air | What’s the Difference between Basic or Advanced Life Support? Basic Life Support Units are designed for inter-facility transportation and pre-hospital response to ill or injured patients. Each unit is staffed with 2 licensed emergency medical technicians. EMT’s generally have over 300 hours of training. They can use AEDs, perform basic and intermediate airway procedures, and in general have all the tools to work many traumas. The ALS units have a minimum of one paramedic and one EMT, can administer certain medications, and have advanced airway equipment, cardiac monitors, advanced cardiac life support equipment and blood glucose testing equipment. Paramedics usually have over 1000 hours of education and training. They can start IVs, push medications, and perform more advanced procedures. The EMT-Basic level is like getting an undergraduate degree, everyone has to start with it. Then one can go on and get their “Masters”, as an EMT-Intermediate/Specialist. The highest level is the EMT-Paramedic. Paramedics have the ability to make fast, responsive life-saving decisions in the field to prepare for and compliment the medical efforts of the destination hospital or medical center. Unlike many Houston EMS providers, BestCare EMS provides both ALS and BLS emergency medical services. This include MICU (Mobile Intensive Care Unit) capabilities, CPR, basic Life Support, Critical Care, Advanced Life Support, Administering medication and Starting /Preparing IV’s. For more about BestCare’s Emergency Medical Services, Visit our Services page.